It's time for the weekend boot spots and we have, as it's custom, been around the world to bring you the very best. We have classic Puma lightweights, exclusive Pelé Sports colourways, custom boots, prolific boot-owners and then we've also made room for some boots, that had days to forget. 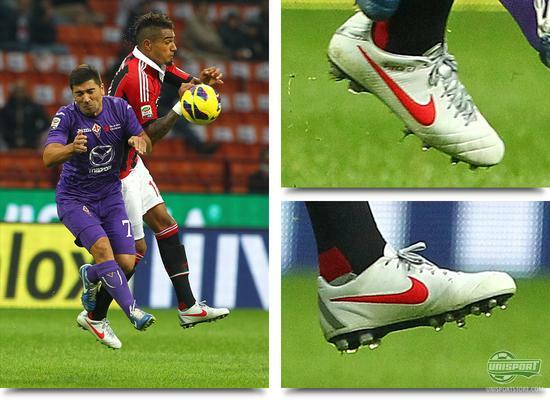 Kevin-Prince Boateng (AC Milan)  Nike Tiempo Legend IV Elite White/Siren Red/Metallic platinum Only this midweek we spotted the Ghanaian attacking profile in a pair of Nike Mercurial Vapor VIII ACC Retro/Total Orange/Challenge Red, that he for the most part of the season has been using. For the game against La Viola (Fiorentina) he had however, found a pair of Nike Tiempo Legend IV Elite White/Siren Red/Metallic platinum from the back of the cupboard. It's a rather sudden change and it'll be very interesting to see if it lasts. What do you think? 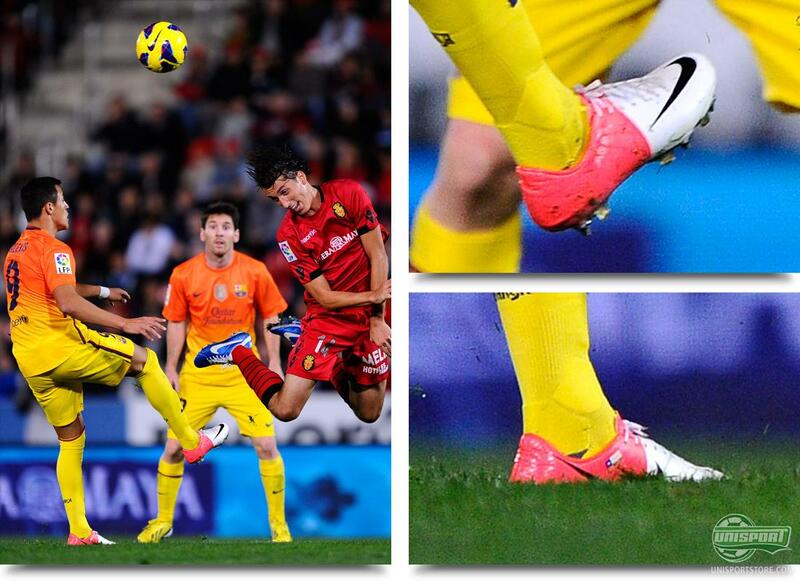 Papakouly Diop (Mallorca)  Puma V1.11 Yellow/Purple The first Puma classic of the day, we find at the feet of Mallorcas defensive midfielder, who in the game against FC Barcelona was given quite a job to do, when tasked with keeping the Catalan offensive quiet. 3-0 was the half time score to Barcelona, but after showing great heart Diop and Co. fought their way to 3-2, before Lionel Messi, closed the game with his record goal, as the game finished 4-2. A poor end result shouldn't take anything away from Diops elegant boot choice, as he picked the fresh V1.11 Yellow/Purple. Lukas Podolski (Arsenal)  Adidas F50 Adizero Silver/Orange It was a real London-derby, as two of the cities many top flight clubs met at the Emirates Stadium. Arsenal faced Fulham and it would be one of the most high scoring affairs, in this rounds Premier League, with a final score of 3-3. 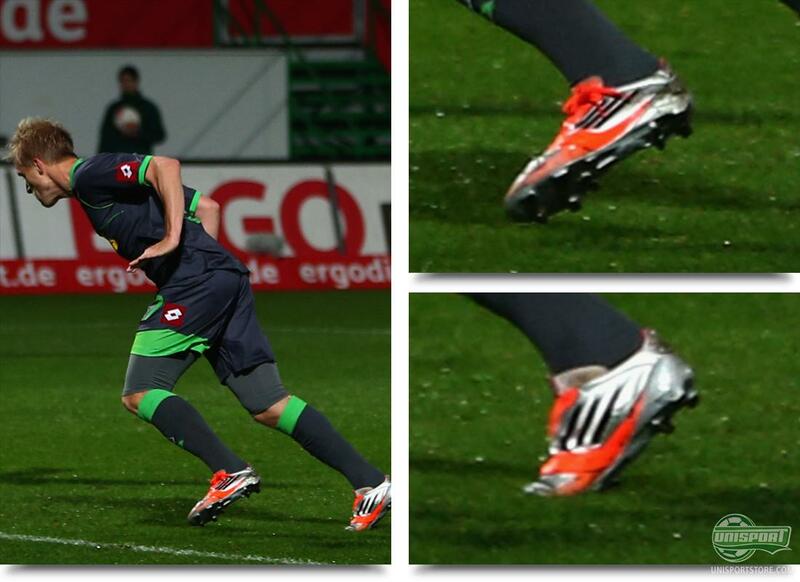 Lukas Podolski made it 2-0 in his Adidas F50 Adizero silver/Orange and it would seem like he has changed out of his MiAdidas-boots, that he designed himself. 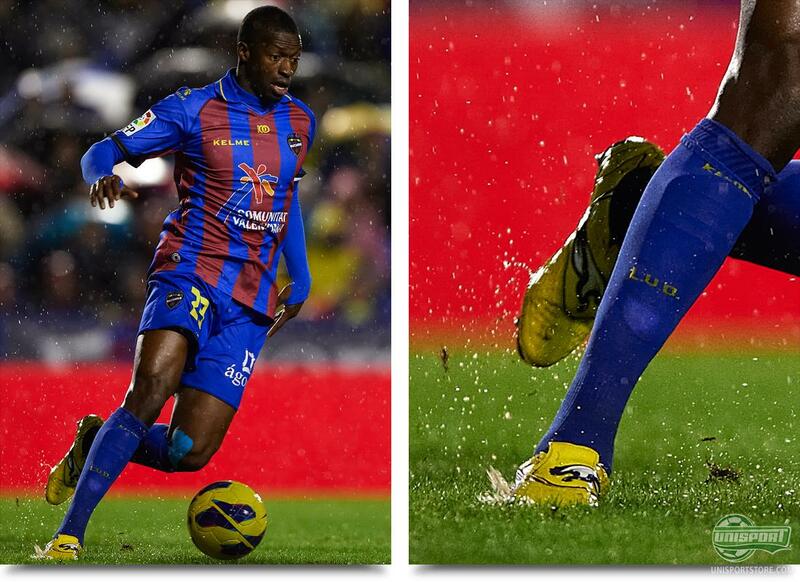 But you would suspect that he would be changing into the new generation of Adidas F50 Adizero soon anyway. Oscar Wendt (Borissia Mönchengladbach)  Adidas F50 Adizero Silver/Orange If your walking around wondering, what's the former FC Copenhagen star doing? Then here's an update. He would actually be the man to make life miserable newly promoted, Greuther Furth. In his Adidas F50 Adizero Silver/Orange he contributed with a goal to an already thrilling game, that finished 4-2 in Mönchengladbachs favor. That apart from the six goals also resulted in 2 red cards. Alexis Sanchez (Barcelona)  Nike Mercurial VIII Clash White/Red The Chilean winger has in the last couple of games surprised us with his choice of boot, when he regardless of impressive displays in his Nike Mercurial Vapor VIII Retro/Total Orange/Challenge Red, has gone back to the older Mercurial Vapor VIII Clash White/Red. We don't dare to even guess, what's behind the switch, but that wont make it any less exciting to follow. Furthermore we had to include this picture, as there's just so much awesome and crazy stuff going on, it's almost too much to handle, but only almost. 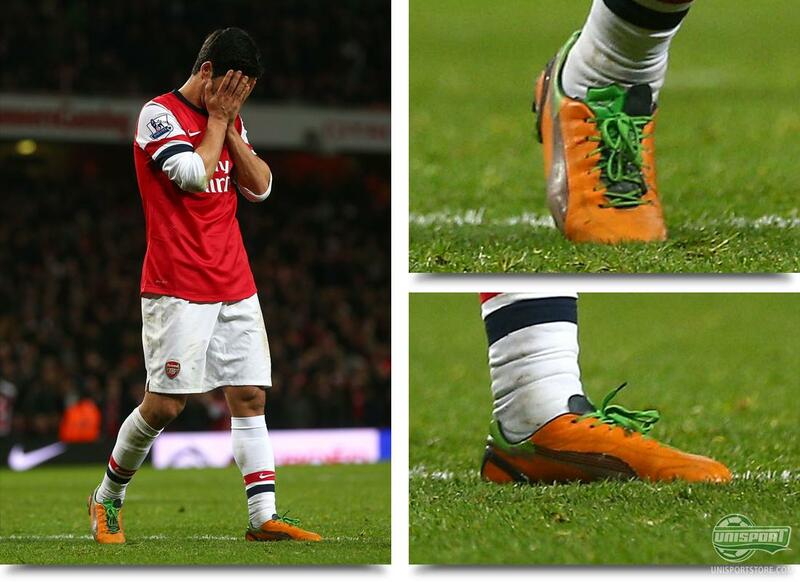 Mikel Arteta (Arsenal)  Puma Evospeed 1 K-leather Orange/Green A pictures says a thousand words and if you followed the Spaniard above, in this rounds fixture against Fulham, then you would know it was a very rough day at the office. First off, The Gunners dropped a 2-0 lead, then when the score was tied 2-2, Mikel Arteta committed a very clumsy foul inside the penalty area, that was calmly put away by Dimitar Berbatov. Arsenal managed to equalise and in the games absolutely last seconds, they were given a ridiculously doubtful penalty, that Arteta and his Puma Evospeed 1 Orange/Green where to try and convert. Unfortunately the Spaniard hit a fairly unconvincing penalty that was easily saved and you can be sure he'll have nightmares about that one. 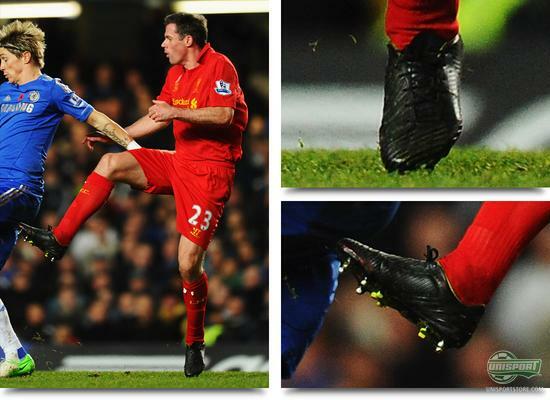 Jamie Carragher (Liverpool)  Adidas Predator LZ SL Custom Blackout The ageing centre-back took yet another shift for his childhood club in Martin Skrtels absence and did it very well indeed. We have taken a look at his boot, which we at first thought was an Adidas Predator LZ SL Blackout, when we could just about make out the catching colour under the black cover. On this picture we can however not help, but notice the Pass Pad with Memory Foam, that isn't to be found on a LZ SL. That it's been completely custom-made, could be an explanation. What do you think? 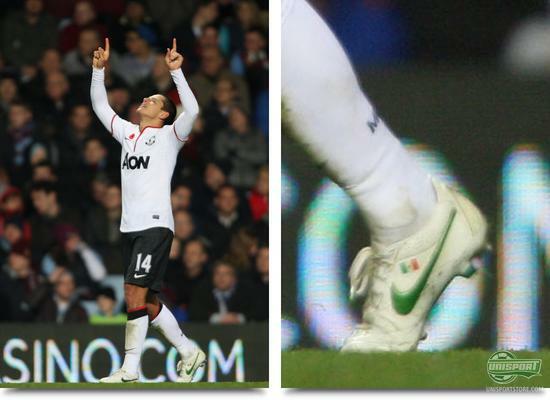 Javier Hernandez (Manchester United)  Nike Tiempo Legend IV White/Green There's starting to develop a pattern in Manchester Uniteds season, that's produced comeback after comeback. In the weekend they again faced adversity, when they away from home, fell behind 2-0 against a potent Aston Villa, but in unfathomable fashion they managed to turn the game to a 3-2 win. This was mostly thanks to half time substitute Chicharito, who was directly involved in all 3 goals The Red Devils scored, while wearing his Nike Tiempo Legend IV White/Green. After the game Sir Alex Ferguson had to admit, the little Mexican had earned a place in the starting line-up for the next weeks game against Norwich. 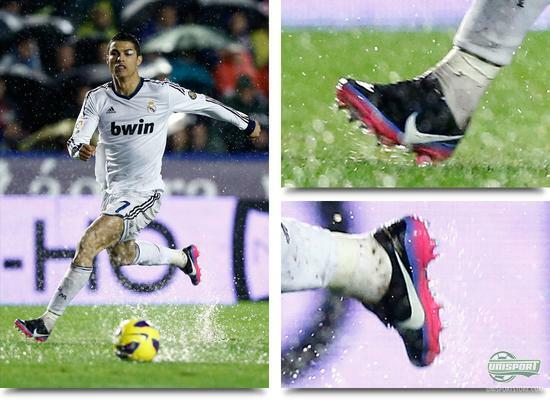 Cristiano Ronaldo (Real Madrid)  Nike Mercurial Vapor VIII ACC CR7 It looked more like a game played in England than Spain, when Levante hosted Real Madrid. In a game that resembled water-polo more than football, because of the massive amounts of water, Ronaldo got off to an unfortunate start, as he already three minutes in, had to be treated for a split eyebrow. This was however not enough to stop one of the worlds best footballers, who probably was quite grateful, that his own personalised Nike Mercurial Vapor VIII ACC CR7, had also been given All Conditions Control, when playing in such atrocious conditions. 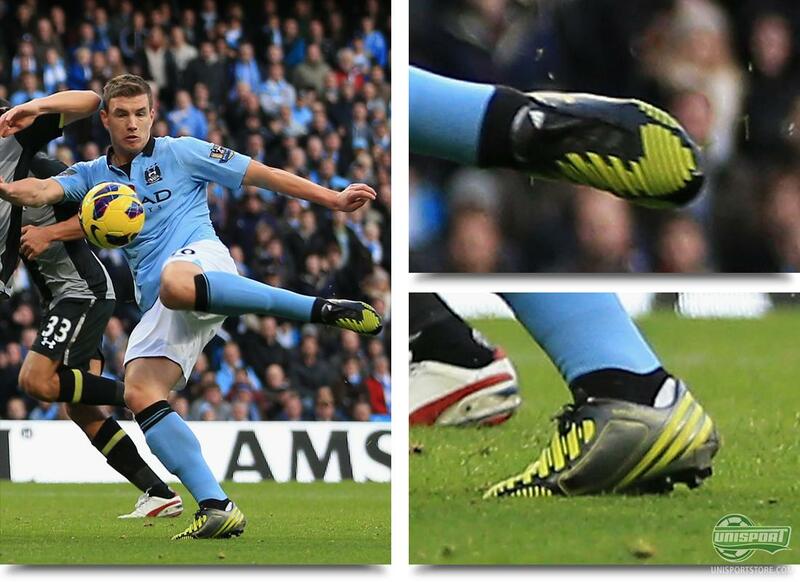 Edin Dzeko (Manchester City)  Adidas Predator LZ Black/Silver/Neon The Bosnian striker looks like he's starting to establish himself as the Premier Leagues best super sub, as he now on several occasions has brought things level and decided important games for the defending champions. 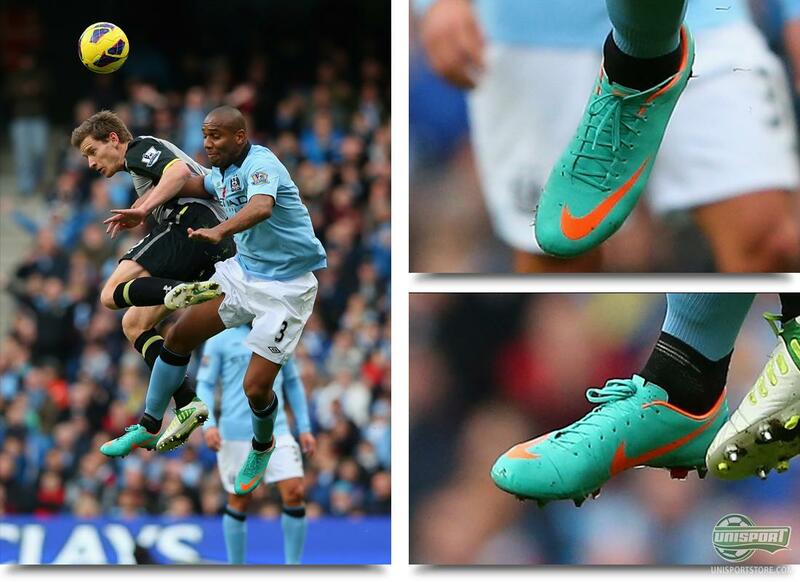 Against Spurs, Dzeko thumped home, while wearing his Adidas Predator LZ Black/Silver/Neon, after a masterful cross from David Silva. Citys number 10 is in the meantime not contempt with his substitute role and is bugging Mancini for more playing time. Has he earned it? Marouane Fellaini (Everton)  Nike Tiempo Legend IV Clash White/Black The Belgian midfielder has taken everyone, by surprise this season and has already scored twice as many goals, as he did in the entire of last season. He single-handedly turned the game against Sunderland, when he scored to level the scores and then later on, back heeled through the legs of John OShea to assist Jelavic. As he always does, he wore his Nike Tiempo Legend IV Clash White/Black, and wouldn't you think they will be chosen again? 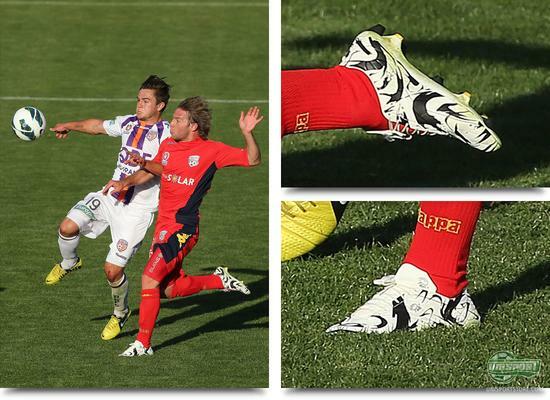 Jeronimo Neumann (Adelaide United)  Pelé Sports Trinity 3E SL SheOne Limited Edition The man with probably the coolest name in Australian football, also wore probably the coolest football boots on sale at the moment. A pair of Pelé Sports Trinity 3E SL SheOne Limited Edition, that are a collaboration with graffiti-artist James Choules, that goes by the name of SheOne. A completely unique boot, that on top of fantastic innovation and technology, can brag of having one of the most noticeable and visibly appealing designs ever. Big thumbs up from here. Maicon (Manchester City)  Nike Mercurial Vapor VIII ACC Retro/Total Orange/Challenge Red The Brazilian right back is getting closer and closer to a place in the starting line-up and that might be because he has gotten a bit more speed in his boots. That's because he has changed out the fatter and heavier T90 Laser IV with the lightweight Nike Mercurial Vapor VIII ACC Retro/Total Orange/Challenge Red. 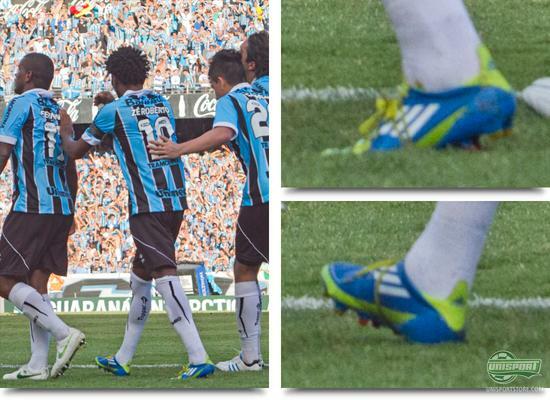 On top of giving Maicon explosive speed down the right-side, his new boots also matched the sky-blue Manchester City home-kit, extremely well, so you would think, that we will see him in Vapor VIII again next weekend. Michel Morganella (Palermo)  Puma V1.11 SL Turquoise/Green/White Even though he has a super-mega Italian name, the gentleman above is actually born and raised in Switzerland. Now he has however followed his names calling and moved to the Serie A, where he after two years on loan at Novara, plays for Palermo. 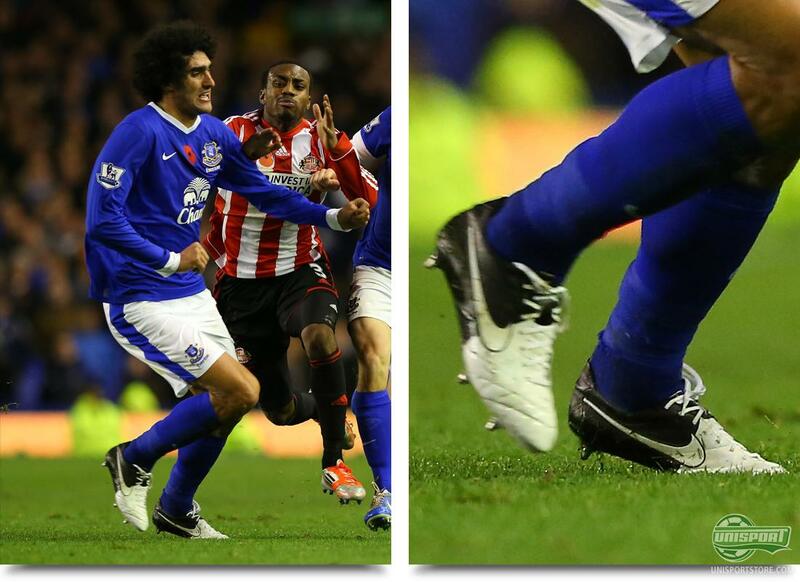 Here he plays right back and taking his boot choice into consideration, there should be plenty of speed in his raids up and down the wing; a pair of Puma V1.11 SL Turquoise/Green/White, that weigh less than 149 grams and therefore clock in on a honourable second place on the list of the worlds lightest boots. Zé Roberto (Gremio) Adidas F50 Adizero Prime Blue/Slime/White The Brazilian legend has just hit the 38 year old benchmark and can boast having played for 9 different clubs and Bayern Munich twice. In the twilight of his career, he has chosen to move back home to Brazil, where he represents Gremio, the fourth club he plays for in his home-land. He does represent them in style however, where he has chosen the only boot, that can brag about beating the formerly mentioned Puma V1.11 SL, on the weight front. It's the Adidas F50 Adizero Prime Blue/Slime/White. 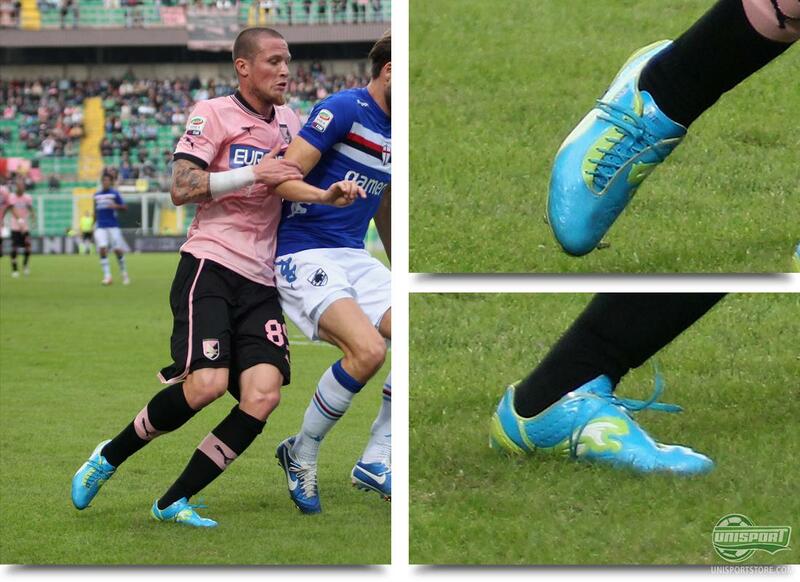 This has got to be the classiest way to end of your career boot-wise, wouldn't you say? It's time to get back to Earth after a trip to planet boot spots and the journey around the world of football, hunting for cool boots, has definitely born fruit. Lightweight classics, Custom-made boots, boot switches and Limited Editions where just a fraction of this weeks spots, but which did you enjoy the most? Did we miss anything? Tell us in the comment-section down bellow.